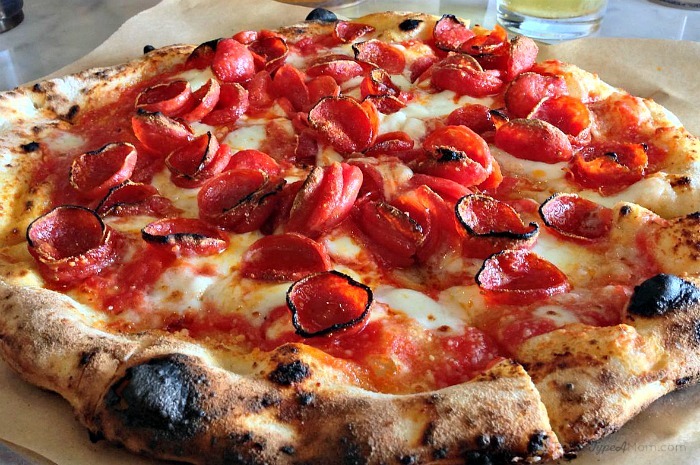 Home » Texas » Pieous: Best Pizza in Austin Area Revealed! 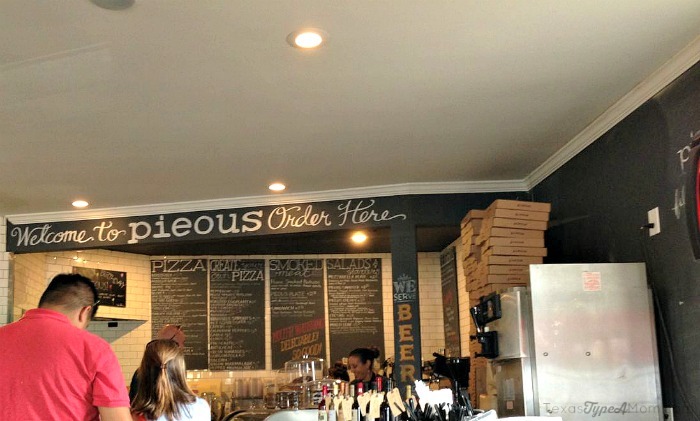 Pieous: Best Pizza in Austin Area Revealed! There are very few foods that I could eat every day and never tire of. However, pizza is one of those foods. I always loathed eating cafeteria food. But, if I absolutely had to, pizza was the best day which is pretty sad considering even the pizza was lackluster. Even as I got older, I used to assume that pizza was a “safe” option when dining out. As I’ve gotten older my palate has evolved and what once was a safe food, is no longer. These days I can’t stand the thought of eating mass produced, mediocre pizza. In a pinch I’ll eat some national chain, delivery pizza but this is not something I eat on a regular basis. I’ve shared with you the best restaurants in Austin. And in fact, some of the best pizza I’ve ever tasted has been in Austin but no longer do I fight the traffic to dine at one of these overcrowded, overhyped hot spots. But about a year ago, our family stumbled upon a gem just west of Austin and we haven’t looked back. Had Pieous been around when I created my best restaurants in Austin, it definitely would have ranked at the top of the list! 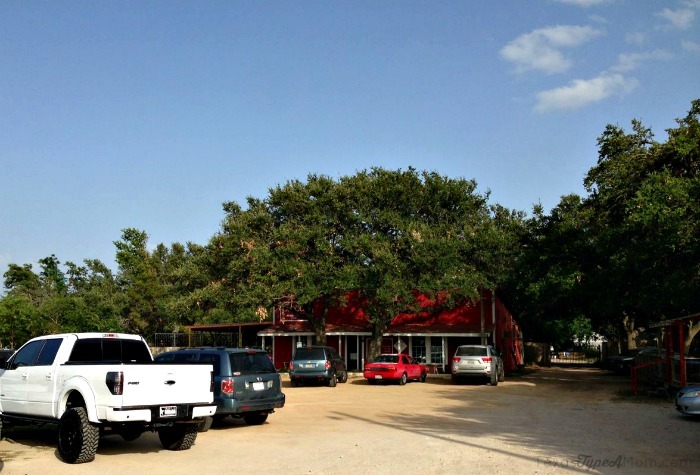 You can find the best pizza in the Austin area just outside of Austin in Dripping Springs. Pieous is the love child of owners Josh and Paige and once you’ve visited their cozy, food haven you’ll soon realize that you need a new line item in your budget so you can feed your newest addiction. The dirt lot, small red building, and covered patio make way into an open dining area covered with chalkboard walls including a small corner for kids to have fun drawing on. Chalkboard menus cover the rear right corner of the building and Paige is usually super helpful in taking your order. As you’d expect everything on the menu is as delicious as it sounds. While we’ve tried some new things from time to time, we’ve developed a “usual” order from nearly the beginning. In fact, Paige can look at my husband and predict what he’s going to order and it’s perfection…every time. Not only are the owners super personable and friendly, everyone we’ve encountered has been nothing but helpful and they all make you feel like family! With pizza as unbelievably fresh and original as Pieous it’s understandable that there can sometimes be a wait. If dining inside is your thing, there’s plenty of seating in there as well! At my best estimate there are at least 7 tables that can seat four as well as two long picnic tables, and bar seating along the kitchen prep area where you can see Josh (one of the owners) working his magic. 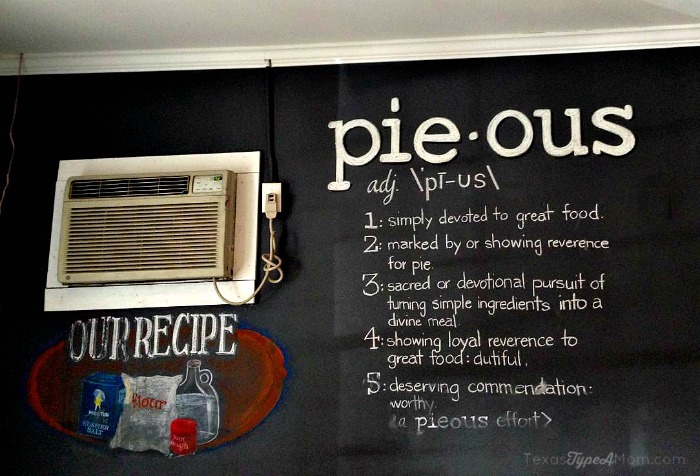 We’ve eaten in all of the available zones at Pieous and outside is our hands down favorite! We almost always sit outside because we love dining al fresco and it’s just easier with kids. But this spring, Pieous covered their outdoor seating making things even cooler when eating outside. An appetizer is necessary to pass the time until your order is ready. Especially with little ones in tow. If you’re in the mood for a salad, the Choppy is definitely the way to go. It’s even a salad that both girls would eat a little of. However on our second visit, we ordered the Pious Plate. Our girls that had never tasted pastrami before in their life and are obsessed with the Pieous Plate. Aside from a few smears of mustard, there’s nothing left on the plate when our crew is done with it. 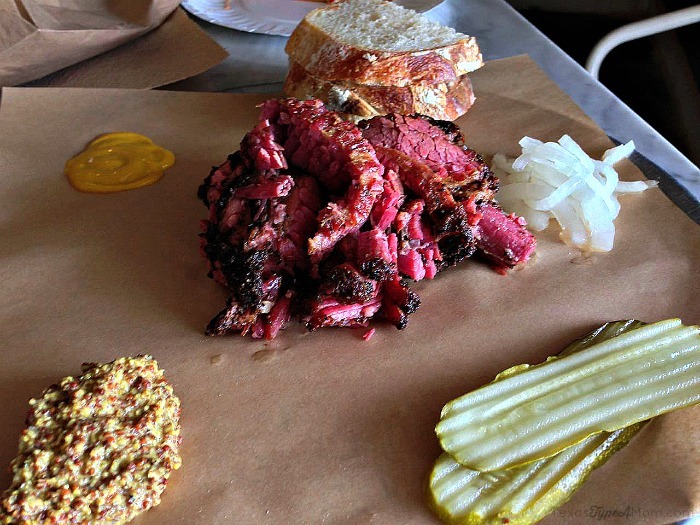 The pastrami and sourdough bread is made fresh on sight every day and is unbelievable! Melt in your mouth amazingness. This is our go to appetizer, but is such a decent serving of food that it could easily work as an entree. As if my previous posts for spicy recipes haven’t been an indication, I have a serious sweet spot for spice in almost everything that I eat. There’s just something about a pizza (or any meal for that matter) that has a little heat that just takes it to a whole other level. My go to pizza at Pieous is the House on Fire – it’s absolute perfection. When ordering a pizza for kids, make sure to ask they double cut it so it’s easier for little hands to pick up! Each of the pizzas on the menu would be considered personal pizzas by other restaurants standards but can easily feed 1-2 depending on your appetite. The standard house crust which is baked in a wood fire oven in the middle of the restaurant for just a minute or two comes out with a crust that’s slightly charred and slightly chewy. The topping are fresh, flavorful, and abundant. And if you don’t see a combination that’s appealing, well first what’s wrong with you?! you can always make your own pizza to enjoy! What meal is compete without dessert?! We’re always eating with littles so thus far our desserts have been limited to two, although I’m sure they’re equally as amazing. The favorites among our crew are the tiramisu and chocolate chip cookie. 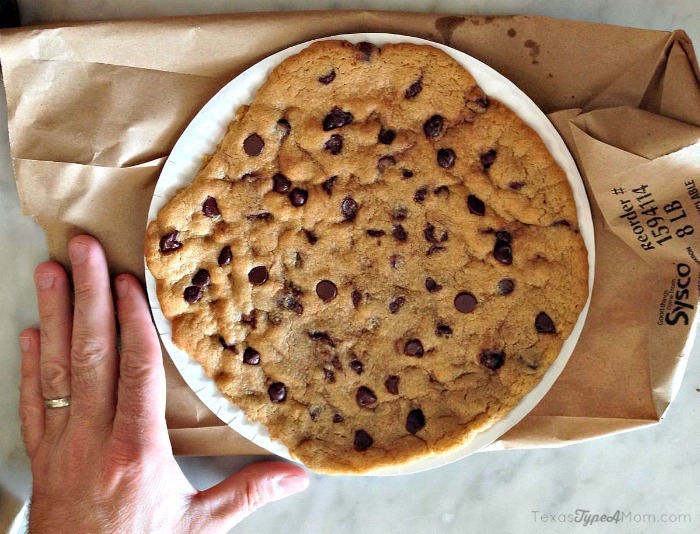 What makes this chocolate chip cookie great is that, like the pizzas, it’s the perfect combination of crunchy and chewy! Not to mention it’s served (and takes up the surface area of) a paper plate! If that’s not an incentive for a kid to finish their dinner, I don’t know what is! 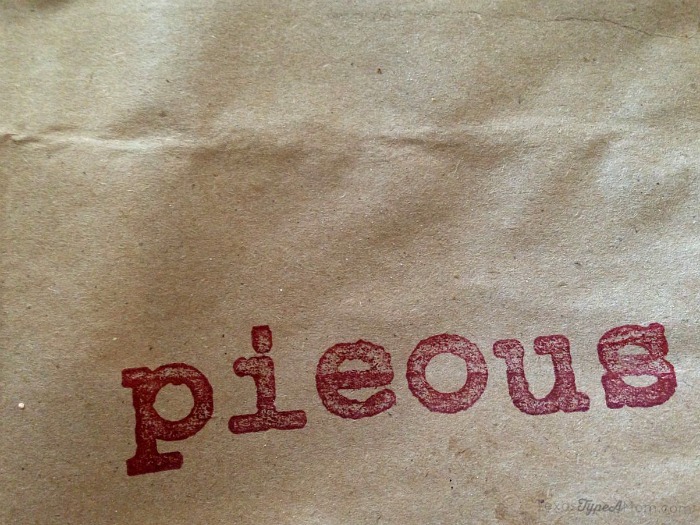 If you’re wondering what it’s like to obsessed with a restaurant, try out Pieous and I’m sure you’ll quickly become a convert! Living in a foodie haven like Austin, word of mouth about a restaurant often carries but this is the first restaurant I’ve been such a huge fan of that I’m singing the praises of it at everywhere from preschool drop off and playgroups to my hair stylist and dental hygienist! I will warn you: before making the trek out to Dripping, make sure to check the Pieous Facebook page. They’ve been known to run out of pizza and pastrami on occasion, especially on the weekend. Also the awesome folks at Pieous deserve a day off too, so if you head out to Dripping on a Monday you’ll find they’re closed. 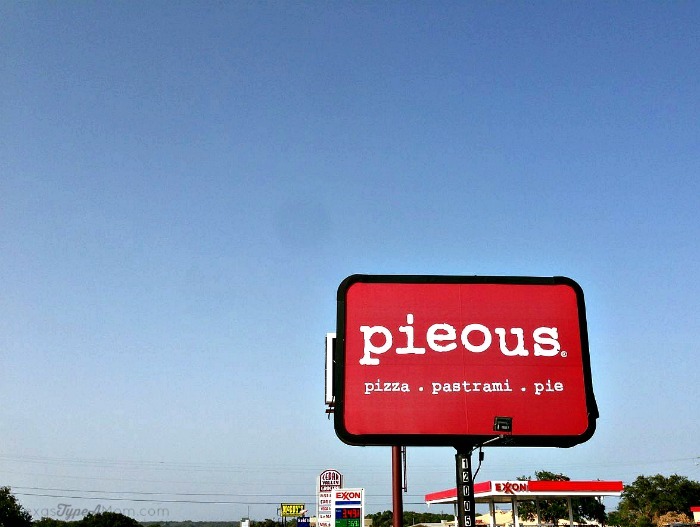 Have you tried the best pizza in Austin at Pieous?! If you live here, why not? And if you don’t, what’s your favorite style of pizza? 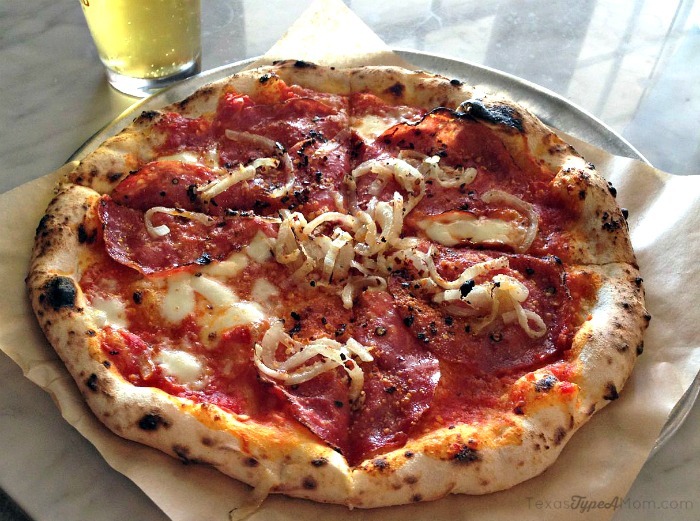 Thanks to your Post, we are now planning a trip from San Antonio to Dripping Springs to try out this pizza. Looks and sounds so good. As we are up in our years and do not get out much it will be an adventure for us. Thank you.